For years multiculturalism and diversity has been a passion of mine. As a person of privilege, I have experienced the resistance to multiculturalism and diversity in myself and others, and have become deeply interested in the process of helping people acknowledge and overcome their prejudices and racism. Part of the challenge is that there is no one path promoting this type of change. There is a need to employ a variety of strategies from diverse voices to address prejudice and racism. Recently, my focus in my own advocacy shifted to seeking greater wisdom regarding which approaches are effective in particular contexts. Frequently, our common forms of dialogue on diversity become intellectual debates that strengthen barriers and resistance instead of nurturing deeper understanding and empathy. While intellectual debates are sometimes necessary and can be effective, more often they are not. In the past several years, Nathaniel Granger, Jr. has been a regular collaborator on presentations, scholarly writing, and other advocacy projects focused on multiculturalism and diversity. We both enjoy including various forms of creativity, such as poetry, into our presentations. It is often the integration of the poetry and other forms of the arts that has changed the direction and depth of conversations, opening up new ears for listening and understanding. From these presentations, we conceived a book of poetry on multiculturalism and diversity, eventually resulting in Stay Awhile: Poetic Narratives on Multiculturalism and Diversity. Poetry shifts us from our normal way of approaching a topic; it pushes us to listen with our hearts. When stuck in academic or political debate, the emotion that frequently dominates is anger, igniting defenses. Poetry can disarm by speaking from experience, not facts. It tells the story of the heart. It slows the conversation. In debates, participants often fall prey to thinking about their response instead of listening; however, with poetry those in dialogue often are drawn to pause for reflection after the poem. In our modern culture, we have too often forsaken the sacred wisdom embedded in the history. Gradilla (2015) states, “…in all ancient societies poetry was seen as the purest and most dangerous form of truth and knowledge” (p. 7). Similarly, Hoffman and Granger (2015) state, “ Before there was psychotherapy, there was poetry, which can be recognized as one of the oldest healing arts that has been utilized across many different cultures throughout history” (p. 16). Traditional wisdom has long recognized that poetry can be a powerful part of individual and collective healing. It is unfortunate that in seeking progress we have forgotten this ancient piece of wisdom. It is my hope that we can regain our connection with this ancient healing art through learning to apply poetic narratives and understanding to our conversations on multiculturalism and diversity. Alsoraimi, N. (2015). Crowded (poem). In L. Hoffman & N. Granger, Jr. (Eds. ), Stay awhile: Poetic narratives on multiculturalism and diversity. Colorado Springs, CO: University Professors Press. Gradilla, A. J. (2015). Foreword. In L. Hoffman & N. Granger, Jr. (Eds. 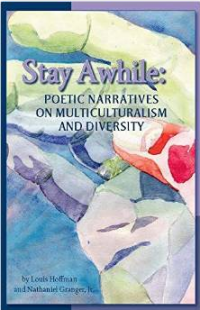 ), Stay awhile: Poetic narratives on multiculturalism and diversity (pp. 7-8). Colorado Springs, CO: University Professors Press. Hoffman, L. & Granger, N., Jr. (Eds.). (2015). Stay awhile: Poetic narratives on multiculturalism and diversity. Colorado Springs, CO: University Professors Press. Hoffman, L., & Granger, N. Jr. (2015). Introduction. In L. Hoffman & N. Granger, Jr. (Eds. ), Stay awhile: Poetic narratives on multiculturalism and diversity (pp. 9-17). Colorado Springs, CO: University Professors Press. Jackson, T. (2015). Preface. In L. Hoffman & N. Granger, Jr. (Eds. ), Stay awhile: Poetic narratives on multiculturalism and diversity (p. 5). Colorado Springs, CO: University Professors Press.